I have the ones above for the full bezel area. I used these for mine. MuddyM kindly scanned and posted. 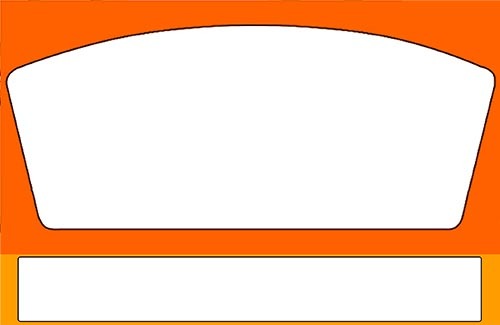 Does anyone have a copy of the CP template? The ones at the URL linked don't seem to be there any more. Thanks. 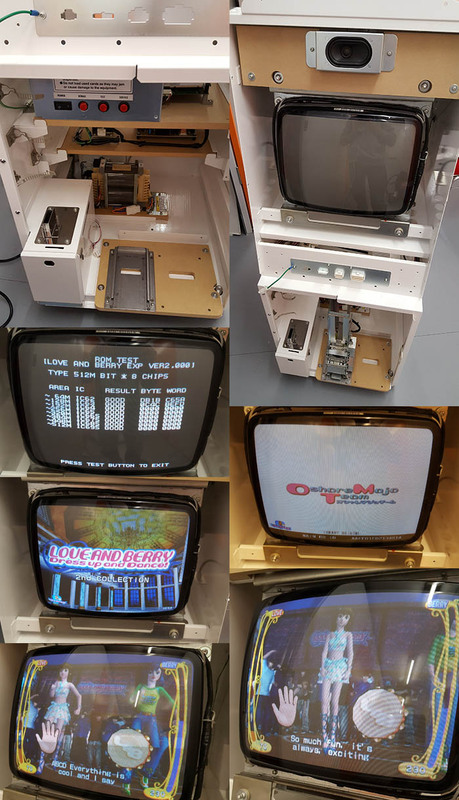 Flinnster, I’m currently putting in wiring for Dino Jamma cab and thought it might be an idea to use the same wiring layout from your photo for the control panel. The idea is to eventually have a few different panels I can swop out so need to keep to the same layout standard on them all. Can I ask if your pin layout diagram is viewed from the front of the plug or from the rear where the wires come out? Nice one for adopting the Flinnster Dino Wiring Standard! 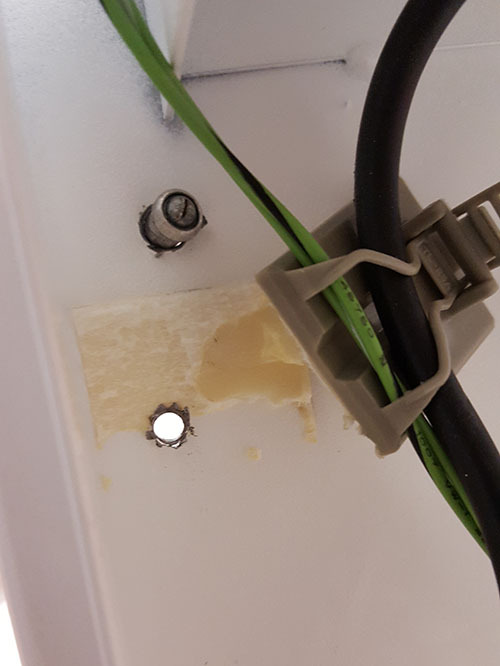 Yep so my wiring diagram is for the plug that's connected to your control panel buttons + stick, when viewed from the front of the cabinet looking inwards as if you are about to plug it straight in. So yes, when wiring the loom side on the JST socket that sits in the metal strip under the control panel, everything will be mirrored left to right of course. I find it's best to wire a single joystick first from the control panel plug side, then do the jamma loom side for the socket, and give that a test. 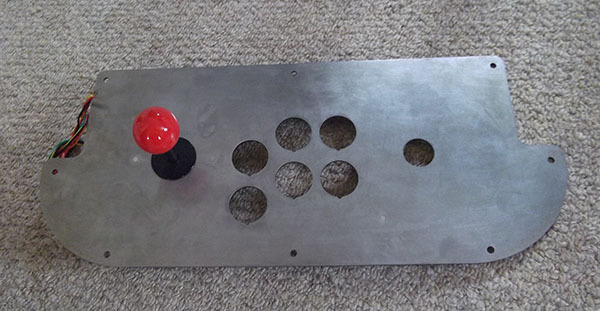 Initially, I’ll be wiring up a 2L6B panel and was thinking of wiring my connector as your 2 player, 4 button Neo Geo layout with the (not required for my 2L6B panel) P1 BUT4 wire going to pin 25 on the Jamma connector and P2 BUT4 to pin c. I would probably leave P1 BUT5 and P1 BUT6 blank. I was thinking of keeping the existing Dino 8 pin connector as well and using it as a possible kick harness and leave the GND and 5v wiring in the original position. That way it could power a spinner/trackerball if needed. The other 6 pins could be used for Player buttons 4-6 wired to a separate JST connector near the Jamma connector for ease of access should I need the additional buttons in future. What do you think? Have I got every base covered? Yep, I'm doing a rotary stick control panel soon. The currently empty middle JST connector holes will be how I connect up the rotary ribbon headers.... if I have enough pins! Started cleaning up a Love & Berry cab that I picked up a little while back. Nothing that special to report really, just the usual process of stripping everything back to give it all a really good clean over and check all the connections before firing up. I was interested in this cab to see if the wiring differered at all from the Dino Kings I have done in the past. I can report it's practically identical - the only difference is the monitor topped single speaker at the top of the cab, and the holes drilled in the bezel for the speaker area. It was sadly from a ferry company, so the sides have rivet holes drilled where restraining brackets were used to hold it in place onboard ship. I am thinking either to put small coach bolts in to mask the holes, or to remove the art and use car body filler and a gloss paint pen to touch up the holes. Sadly the system SP board didn't have a compact flash card in it that holds the game data, despite what appears to be the proper 'key chip' in the mobo - so I'm after an image of the LnB game to write to a CF card if anyone has it. So a few before and after pics.... only got as far as the mains power area so far, still plenty to clean and reassemble. Got all of the wiring and components out of the cab frame and gave the metalwork a thorough hoover and scrub down with wipes. Tons of that greasy carbon dust you get from the monitors in this one, but not too bad really - just dusty at the bottom, and the usual bits of coke spillage stuff and bits of crunchie bar going on in places. The bezel had the op sticker removed with the help of a little novus, and the plastic surround actually had what appeared to be very old chewing gum on it (it looked like a rusted bolt originally!) that hot air and isoprop cleaned up nicely, leaving a blob of white plastic underneath, compared to the yellow of the overall plastic - so must have been there for years! Cleaned the base and wheels, just need to give them a bit of wd40 so they spin better now. There's a fair bit of orange paint scrape around the back and base of the cab, so I'll likely use a very light bit of magic eraser to get that back to white again. It’s amazing how nice these cabinets can look with a bit of elbow grease. Would body work filler work ok on these as the metal is quite thin? It’s not so bad putting coach bolts in where the front security bar was, but there’s quite a few holes on the side of yours so I would be tempted myself to try the filler. What game do you intend to use the cabinet for? Oddly the rivet holes look far cleaner on the inside at the moment, so most of the 'damage' done was to the vinyl artwork I think / hope. No idea on the exact game yet. I was pondering perhaps to re-use the bezel with the pink colour frame on my Bubble Bobble cab, as the colours may work well there. Might need to figure out the marquee though, as all those speaker holes would probably look a bit odd with the Bubble Bobble logo there. Yep I've seen people use liquid metal on CP holes - but I've never used it myself yet! How much sanding does it usually need? I have a feeling the gloss white paint coat on the outside of this cab is going to be in very good shape once I'm done, yet once I start sanding any areas a respray / powdercoat might be needed. Holes or buggered paintwork.. sigh! Got the main guts of the Love & Berry re-assembled now everything has been cleaned and fired it up for the first time. Most of it is looking pretty sparkly now (pretty different from the original stripdown pics earlier anyway! ), just the control panel to do really - the two large buttons are proving to be a right pain in the backside to budge. Initially the monitor was dead dark and had no contrast. With a bit of tweaking of the front and rear pots, I got everything sorted and was suprised to find the game boots from the boot eprom with no CF card present. The game must be tiny! 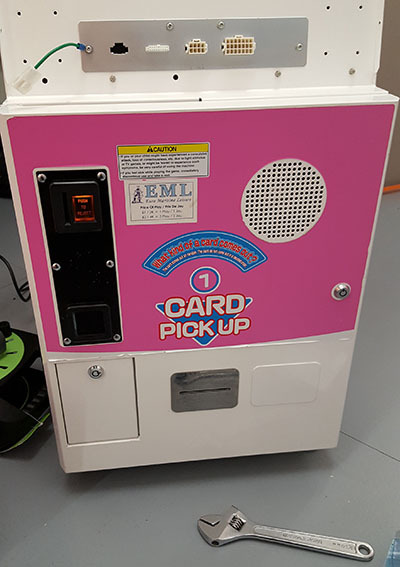 Tested all the functions, barcode reader and card dispenser are all good and the RFID management chip reader is all working correctly too. Both speakers working without any issues - happy days! Sadly the game is even more limited than the Dino King one. At least with Dino King you have a 1/3 chance of winning rock, paper, scissors. Love & Berry is a one button game, you just tap out the beat to watch your character dance. It's a mobile game really. Shame on you Sega..
Next up, cleaning the control panel, and getting some locks for the doors. Locks arrived, so sorted out the modified tangs and fitted those.